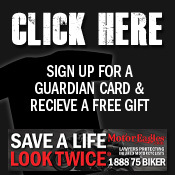 If you haven’t done so already, sign up for our MotorEagles’ Guardian Member Card so you can enjoy all the benefits of being a MotorEagles® member! Whether you’re a lifelong motorcycle enthusiast or you’re just getting acquainted with the biker lifestyle, we know that any rider can appreciate a good rally. We also understand what it means to be a biker, and we share that same thrill for riding that you do. That is why we spend a lot of time traveling from attending different motorcycle events, so that we can share our knowledge and excitement for safe motorcycle riding with enthusiasts across the country.